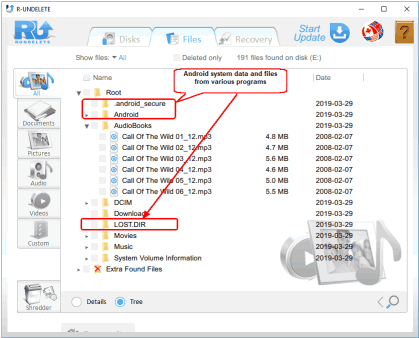 An important note: this article describes file recovery from a memory card connected to an Android phone as external storage. If it is formatted and connected as internal storage (Android Marshmallow and newer), the data on it is encrypted and can by no means be accessed outside the phone. Most phone cards are connected to phones as external storages. One of the advantages of the Android platform over its competitors is its ability to use memory cards to extend phone's storage space. Such cards may be used to store music, photos, movies, and user data for many programs. They also can be used for data exchange between the phone and other computer devices. As usual, a good feature such as this one also has some drawbacks. One of them is the possible data loss when the card isn't handled properly. Most often this happens when the card is ejected from the phone without being properly unmounted. In this case the file system may be damaged so severely that neither the phone, nor a computer can recognize such card, and the files on it become inaccessible. The good thing is that the files on such damaged card usually remain intact and can be recovered in most cases. 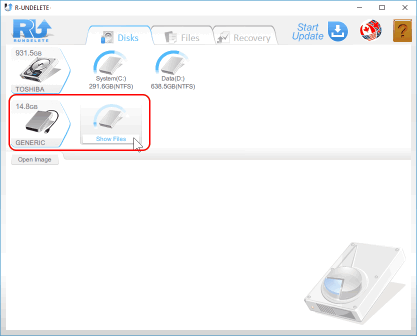 We'll show how to use our file recovery program R-Undelete to do that. Another important note: phone cards are formatted as FAT/exFAT storage devices, R-Undelete recovers files from them for free without registration, thus purchasing the program isn't required. 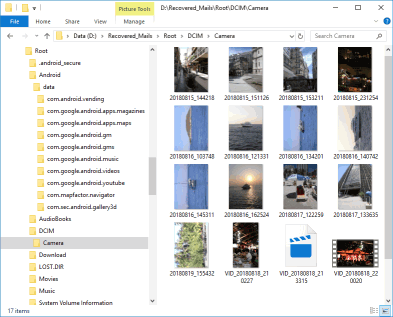 Android phones usually store on memory cards not only user's music, video, photo, files, and alike, but also some service data and files from various programs. That is why we will try to recover the entire folder structure and all files, including service data, and not just common user files. So, we have an SD card that was improperly ejected, its file system is damaged such that the phone and a computer cannot recognize it. The card contains user's photos, videos, music and other audio files, and some service data from the phone and some programs. 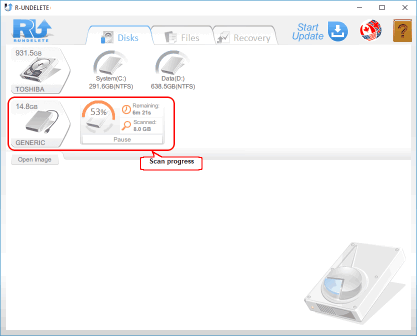 Let's recover the files using our file recovery program R-Undelete. 1. Download and install R-Undelete. See the Download Instructions and Info web page for details. 2. Connect the card to a computer. Almost all laptops have a special slot for SD memory cards, but a USB card reader may be necessary for a desktop PC. 3. 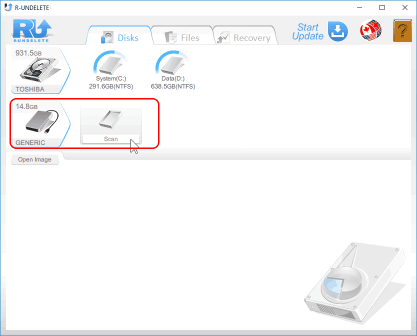 Run R-Undelete and locate the memory card on the Disks panel. 4. Drag the cursor over the Unrecognized Space and click Scan. 5. Wait for scan to complete. It may take a relatively long time if the card is large. 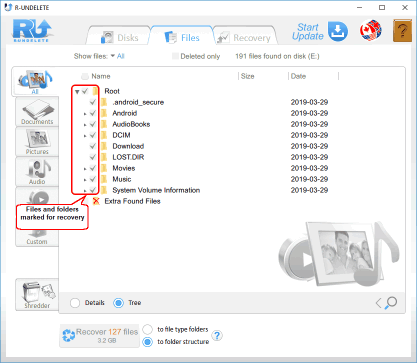 Upon scan completion R-Undelete will show the found disk(s) with the lost files. R-Undelete will show files it found on the disk. You may also immediately preview files of most common types which are presorted on their respective tabs. Note that it's quite common for phone videos to be shot upside down. 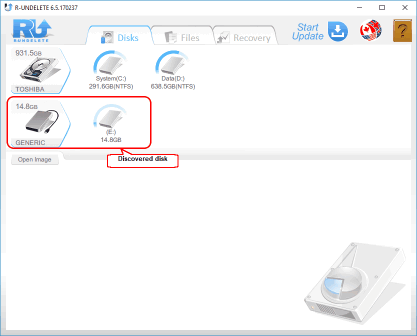 If you still cannot find files you want to recover you may use Deep Scan. 8. When you find all of files you want to recover, mark them for recovery. 9. 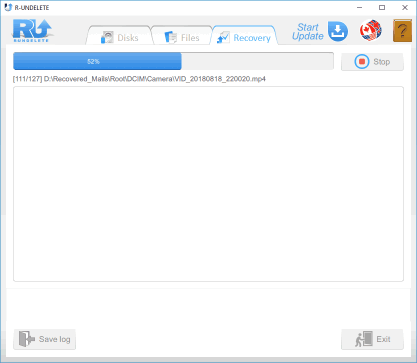 When all of the files are marked, click the Recovery button. 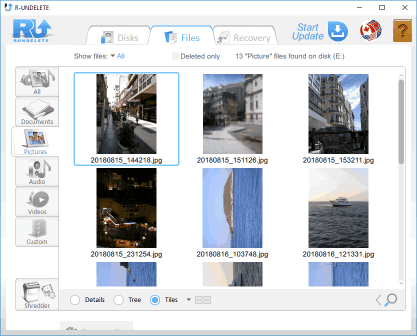 R-Undelete will start file recovery showing its progress. 10. 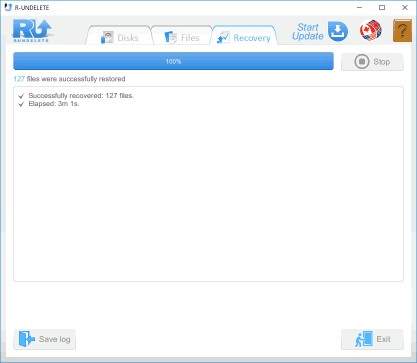 When the recovery is over R-Undelete will show a brief report. and open the folder with the recovered files. As shown, we've recovered the entire file system that was on the damaged memory card. 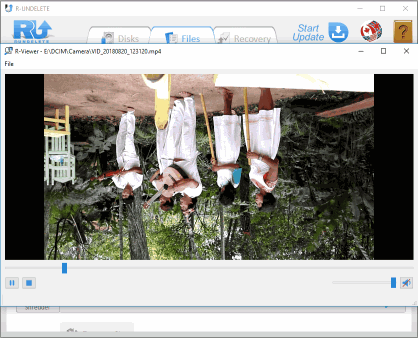 Now we can format the card to create a new file system and copy the recovered files back to it. The card may now be inserted back into the phone and should work as if there was no damage to the card. 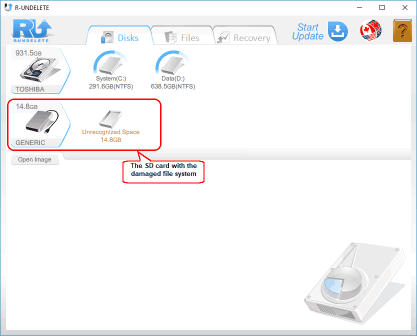 The results of our file recovery show that it is often quite possible to recover the entire file system of an Android phone memory card damaged from an improper ejection.